In the present connected world, e-commerce business is not restricted to a specific geography or demography. Spanning across a global customer base, your e-commerce business needs more than traditional marketing efforts to establish its presences as a global brand. The ultimate goal of any e-commerce store is to gain more customers and improve sales. if you want to create a successful e-commerce platform with excellent ROI, then you need to know that traditional copywriting doesn’t work anymore. Considering that e-commerce is a customer-centric business, we suggest a standard four-step strategy – Inform, Engage, Sell, Retain. Inform your visitors about what you offer and their benefits. Engage your visitors in a conversation about why they need to buy the product. Sell the product via a smooth and seamless transaction such that they come back for more. Retain the customers through effective email marketing and promotional web copies. The best way to conquer this four-step strategy is to include smart copywriting into your content marketing methods. Conventional Content Marketing has moved out from a restricted arena of “delivering what you think is best” to “find out and deliver what your customers want”. In this article, we will discuss a few ways to develop web copies that not only focus on brand promotion but also help improve user engagement on your e-commerce platform. Data-driven content marketing coupled with creative copywriting plays a key role in serving both the purposes – stepping into your customer’s shoes and generating content that converts. Instead of expecting your readers to understand what you are trying to say, make them understand. It is like you sit next to them, and help them read, but virtually through your sales copy. The first and foremost criteria for an email copy that converts is a catchy subject line on ecommerce promotional emails. We need subject lines that provoke the user to open the email, and not mark it as spam. Secondly, use of a conversational tone in the body of an email that actually speaks to the readers, asks questions, provides recommendations and very naively redirects the users to the website. Include a casual and honest call-to-action (CTA) that actually makes sense in the context and is definitely not borderline pretentious. You might have designed the best website with a trendy design, great sitemap, excellent UI and what not. Without a great copy, there is little chance for your products to find themselves off of the shelves. A meaningful, persuasive product description can improve your overall sales strategy in a matter of seconds. How to write effective product descriptions? If you are moving in a direction that’s familiar to your customer, the copy will automatically sell itself. The first step to write effective product copies is to identify your target audience. The mantra is – do not sell baby napkins to a visitor searching for contraceptive pills. Period. Your ideal buyer reads the product descriptions for what they want, but not what they know already. Whether you are selling baby napkins or space rockets, the description should be right on point explaining its benefits and unique features. Let your product copies ask questions on behalf of your customers and answer those questions for them. Consider all the probabilities of questions that might arise from a customer’s perspective and make sure your product copies are addressing the same. Whether an inhouse content writer or a freelance content developer delivers this content doesn’t matter as long as the product descriptions are relevant and meaningful. Search Engine Optimization (SEO) needs no introduction when it comes to digital marketing. On a similar note, e-commerce SEO is a blend of writing creative product descriptions using relevant keywords to display relevant results on the page search. For accurate results and product recommendations, your inhouse website optimization must act like any other search engine. Optimizing your inner pages, site content, product descriptions, product names and product categories with the right keywords is the most basic step to reach a large audience. You can use free keyword analysis tools such as Google Keyword Planner or any other paid SEO analysis tools to gather the following is a great start to stand ahead in the competition. Identifying the right keywords to include in your product categories and subcategories is also a part and parcel of ecommerce SEO. An efficiently written web copy that makes use of relevant and meaningful keywords to address the user search behavior has the ability to influence buyer decisions. Social media is undeniably a powerful tool to engage your audience and start a conversation. With social media, there are only 2 ways to engage your audience – whether you are onboard or never there which means your e-commerce business can either underperform or outperform on social media. Coming back to the point of discussion, we’ve come up with some incredible ways to use social media copywriting for your brand promotion. Remember those Nike shoes that said, Just Do It. The entire world connected to that one line and it has become an instant hit. Old but a great example of sales copywriting. When it comes to using social media for brand storytelling, choice of words is more important. Considering the short attention span of millennials, you don’t have to sell a product in less than 10 seconds but can use this time to engage your audience. If you are promoting a link without description, or an image without a backlink, you are making a huge mistake. Similarly, hashtag research is a great way to identify and pick relevant hashtags. When it comes to e-commerce copywriting over social media channels, you cannot opt for a readymade plan across all channels. For example, what goes well on Twitter might not perform well on LinkedIn. So, choose your words wisely. This interesting infographic from Alibaba’s Facebook Page is a great example of creative copywriting. If you are selling to an audience that is spread across countries and continents, then globalization of your website is definitely on your to-do list. Firstly, you need to pinpoint a specific regional locale in order to give your business a local presence. Global marketing means a global customer base. An international website (read again, international) can multiply your sales. In order to achieve this, you need to customize your website as per the local languages, tastes and cultural preferences. To put it across in plain language, over 50% of global customers are willing to pay if you reach them out in a language of their own. Your website needs to speak the language of your customers. Take Amazon for example. Not only is the website translated for multiple countries, but also customized as per the local preferences. If you want to make your local domains to look genuine, here are some tips for creating multi-language website copies that convert. Do not rely on automatic machine translation tools since they may not be 100% accurate. Hire professional translators to get the job done with full accuracy and consistency. Manual translation ensures correct usage of industry-specific words. Do not ignore SEO in translated content. Ensure your translated content is optimized for keywords and local search engines. For an unbeatable local presence, ecommerce businesses need to customize their sales and promotional email campaigns as per the local cultural preferences. In general, an ecommerce email marketing chain goes like this. Visitors > Subscribers > Customers > Repeat Customers. Throughout this entire lifecycle, emails that are tailored to specific customer needs, are found to make it to the end. User segmentation across your target markets helps identify preferences and tailor offers and deals. Customize offers and deals as per the national holiday calendars for specific geographies to improve relevancy. Market analysis of mobile users before rolling out mobile-only offers can contribute to a great deal of customization. Above all, an incredible sales copy that speaks the language of your audience can contribute to plenty of conversions compared to regular emails. Writing a converting sales landing page for your website in a language other than English calls for research and analysis of local taste and culture relevance. This difference is highly visible when you compare Amazon US website and China website. 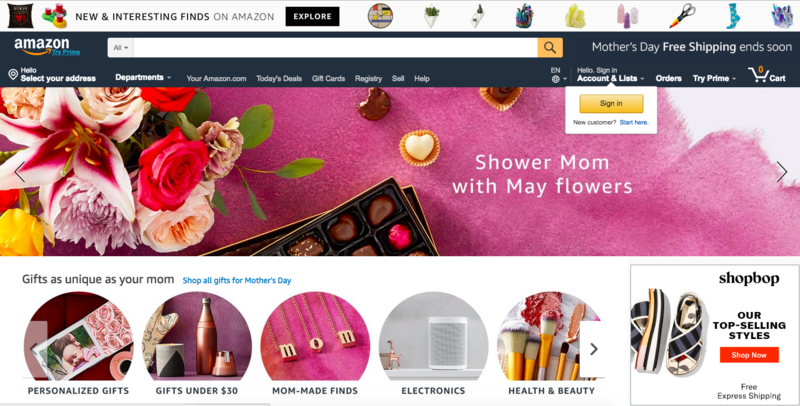 The difference lies in the choice of colors and other user interface (UI) customizations, but it is definitely making a difference for the e-commerce giant. Having discussed a few incredible tips to create ecommerce promotional copies, we suggest a great read from our archives on effective marketing strategies that actually work for your online retail business. In this article we discuss some conventional marketing methods to target, reach and engage your visitors.